viaLibri ~ Londina Illustrata: Graphic and Historic Memorials of Monasteries, Churches, Chapels & Schools, Charitable Foundations, Palaces, Halls, Courts, Processions, Places of Early Amusement & Modern and Present THEATRES In the Cities and Suburbs of London & Westminster. Londina Illustrata: Graphic and Historic Memorials of Monasteries, Churches, Chapels & Schools, Charitable Foundations, Palaces, Halls, Courts, Processions, Places of Early Amusement & Modern and Present THEATRES In the Cities and Suburbs of London & Westminster. 125 Fenchurch St, London. : Robert Wilkinson, 1819. 1st Edition 1st Printing. Half-Calf . Very Good/Not applicable. 4to - over 9¾ - 12" tall. Various.. 205 pages of letterpress and another 125 copper engraved plates + 2 pages of contents and an engraved title page. Of which 34 full page plates are of the London theatres of the day, with interior scenes and stage activity with people watching the plays, etc. 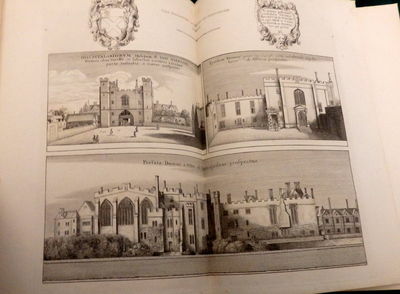 There are double page plates including a rare Holbein engraving of the Great Fire of London. A few plates have pasted in "overslips" showing corrections to the printed text beneath the plate description. CONDITION: The hinges have been repaired, there is a very mild spotting to the backs of some plates, not affecting the actual scenes and also on a few pages, there is the odd mark on an odd page or two. Generally VG+. The old half calf has been retained and although worn is firm and substantial. Large quarto. A Vg+ copy of a scarce book, published by the author who gathered together in this work some of the rarest views that could be found. A second section, extending the theatre interest was completed in 1825. This book is considered complete as NO mention of any extension is mentioned at any stage. Sold as complete and not needing the 1825 continuance.